Manchester City boss Roberto Mancini has confirmed that influential midfielder David Silva will miss the club's next two matches with a hamstring injury. 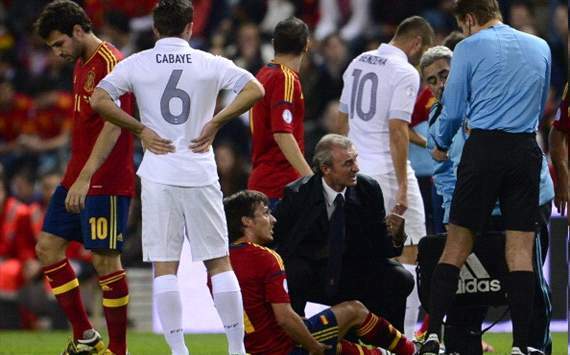 Silva was carried off after 12 minutes of Spain's World Cup qualification draw with France on Tuesday and there were initial fears that he could be set for a lengthy spell on the sidelines. Mancini has revealed, however, that although Silva will miss the Premier League fixture with West Brom on Saturday, as well as Wednesday's Champions League clash with Ajax, he should be fit in time to face Swansea on October 27. "We have a lot of injury problems after the international break," Mancini told reporters. "David has a hamstring problem and is not ready for tomorrow." He added, "We hope that he will be ready for the next Premier League game against Swansea." The City manager also confirmed that Javi Garcia and Jack Rodwell would be missing for his side's trip to the Hawthorns. "Javi I think will be out for another week maybe, Jack is out too," he said.